The unalloyed titanium used for structural applications may be subjected to fatigue in engineering practice. The unalloyed titanium usually refers to commercially pure titanium grade 1, grade 2, grade 3 and grade 4. The titanium’s resistance to fatigue can be measured by the rotating cantilever beam test. A series of specimens are tested at different applied stresses in accordance with ASTM E466. The results are presented as an S-N curve, with the stress plotted versus the number of cycles to failure. The endurance limit, which is the stress below which there is a 50% probability that failure by fatigue will never occur, is approximately half the tensile strength of the titanium specimen. From the perspective of microstructure, many variables, such as grain size, interstitial oxygen content, and cold work hardening, may have significant influence on the the fatigue behavior of unalloyed titanium. 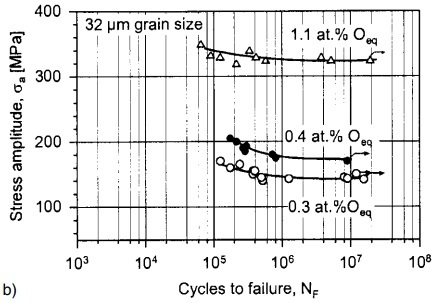 Fig-a: S-N curve showing influence of grain size of pure titanium on fatigue behaviors. As illustrated in Fig-a, as the grain size gets finer (from 110 to 6 μm), the fatigue strength of unalloyed titanium increases from 155 MPa to 205 MPa. This is reasonable since the grain refining significantly improves the strength. Fig-b: S-N curve showing influence of interstitial oxygen content on fatigue behavior of pure titanium. The Fig-b illustrates the influence of interstitial oxygen content on fatigue behavior of pure titanium. 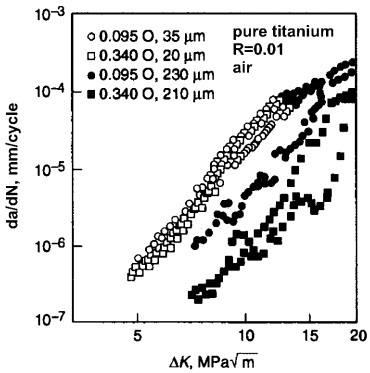 An increase of oxygen content means more oxygen atoms will diffuse into the interstitial sites of the pure titanium. The interstitial diffusion greatly improves the fatigue strength of material. 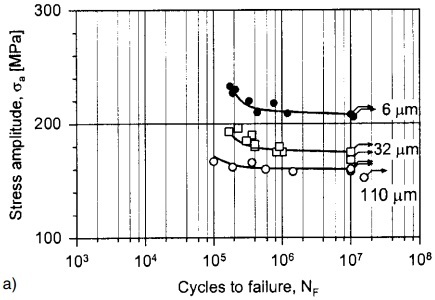 Fig-c: S-N curve showing influence of work hardening on fatigue behavior of pure titanium. During cold working of unalloyed titanium materials, a stress greater than the yield strength is applied. It results in the slip movement of dislocations which created more new dislocations. The increase of dislocations significantly improves the strength/ fatigue strength of material. This is called strain hardening, or cold work hardening. A subsequent annealing treatment will remove the residual stresses due to cold working without causing a change in dislocation density in recovery stage. Further heating may result in recrystallization. Microstructure with low dislocation density appears which has relatively lower strength. Fig-d: crack growth rate of pure titanium in different conditions. In many engineering practices, even there is an initiated tiny crack, the component may not be subjected to failure due to slow propagation of the crack. 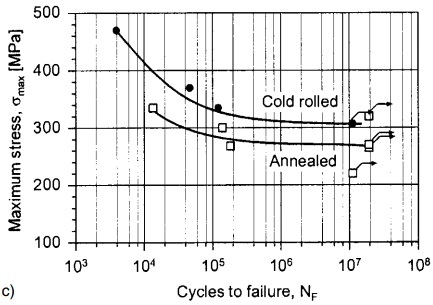 Hence the crack growth rate is an important parameter to measure during the fatigue of titanium. Fig-d illustrates the crack growth rate (vertical axis) versus stress intensity factor range. Different grain sizes and different oxygen contents have significant influences on the fatigue crack propagation in pure titanium.